On Saturday I asked Twitter a question I was a little bit nervous to ask. I like to do this on Saturdays because not a lot of people are around—it's like testing the waters. If you ask on Monday you are likely to get an explosion of responses. I hear white authors say they're afraid to write a diff race cuz they might do it wrong. Any minority authors afraid of writing white wrong? I didn't get a lot of replies, but the ones I did I found interesting. One girl said as a white person she feels like she's told she isn't allowed to write outside her race or her sexuality. Another person owned up to being scared of offending anyone, even unintentionally. Perhaps especially unintentionally. While another admitted she's even afraid to write her OWN race for fear of not getting it right to some people. It seemed there was a consensus that no one seemed to have a problem writing a white person, regardless of race. One person even went so far as to say that because 99% of media is about white people, everyone feels comfortable writing the standard white American. Because we see it all the time. By the time these replies had come in, I'd finished eating my cinnamon toasters and had gotten dressed. Because I was going to the mall to edit my book about a half-Japanese girl who's forced to live with and care for her racist, Alzheimer's-stricken, estranged grandmother. As one does. So instead of replying to tweets, I went about my business with all these thoughts in my head, hoping some kind of answer would surface over time. I worked for several hours in an abandoned corner of the mall, where the tables of an out-of-business cafe still remain. I cut lots of words, as my agent told me to, all while sipping at a Code Red and wishing I didn't have to work on Saturday (which I usually take off). Then I got hungry, since all that thinking burns calories. I wandered to the food court, but everything there looked gross and I wanted something comforting, filling, spicy, and a little bit healthy. makes me drool just thinking about it. So of course I thought of bibimbap. I got in my car and drove to one of the two Korean restaurants in my entire county (There used to be only one! We're moving up!). The place was empty when I got there, and a cute guy took my order and waited on me while I continued to edit in the pleasant silence. This all felt utterly normal to me. The truth is, I didn't know much about Korean food, culture, etc. until about two years ago. I'd always been curious, but all I'd ever heard was that kimchi was gross (so not gross!) and I saw this segment on The Amazing Race in Korea where they had to eat raw octopus that was chopped up but still moving. I know. For reals. This was the extent of my knowledge. I'm not proud of this, of course. Then I got pregnant. Which sounds like it has nothing to do with this story but, oh, does it. Because I got very sick, and pretty much all I could do was lay in bed and try not to throw up. I was so dizzy it was hard to even sit upright. Unable to do much of anything, I lived on Netflix and Hulu but was quickly exhausting my options for shows when I happened upon this thing called Kdrama. I liked anime since I was a teen, so I figured hey why not? I'll probably like this. I picked Boys Over Flowers, and 30 dramas later here I am. When I first started watching Kdrama, not everything made sense even with subtitles. Yes, it felt foreign. It took a few episodes for me to keep the names straight. It took me a couple series to figure out the different titles they called each other and why. And it took me even a little bit longer to understand the potty humor. But none of that phases me at all anymore—I've become accustomed to it because I see it all the time. Therefore it has become normal for me. I'd like to pause here to emphasize that I am NOT saying I know everything about Korean culture because I watch Kdramas. Repeat: I am not saying Kdramas are a completely accurate representation of all Korea/Koreans or that I know everything about what it's like to be Korean or live in Korea. This is an example—bare with me here. But this IS what I'm saying: I believe that because I watch an increased amount of media from other cultures (mostly Japanese and Korean), these cultures have become somewhat normalized for me. I am comfortable with them. I don't feel that unease some writers express about writing another race, at least not anymore, because I've deliberately exposed myself to diverse media. This idea of being immersed in a culture through media might be a big part of why no one seems to be afraid to write a white character in America—it's just so darn prevalent and normal. I've now realized immersing myself in media from other countries has had a huge impact on how comfortable I feel reaching out and learning about another culture. Which means inclusion of diversity in all media is that important. It IS that big a deal. If we aren't exposed to diversity, humans naturally fear the other. The arguments in media are often confusing—we can't include diversity because it makes people uncomfortable and then they won't buy but we promise we WANT to but we're also scared to do it wrong and people DO rip you to pieces for doing it wrong. It's a mess, really. But here's the rub: No one will ever feel comfortable with diversity if we continue to avoid it in our media. People won't start getting it right until we start seeing more examples, more stories, more people stepping up. As I stuffed myself full of bibimbap, this is what I thought about. We keep wanting the fear to go away before we include—but I'm pretty sure it doesn't work that way. The only way to get rid of that fear is to include now and help people learn until it's so common no one can possibly be afraid. Great question, great post. I have asked (on my blog and over at Absolute Write) what people 'see' in their heads as default if a character's race isn't explicitly state. I assumed most would see their own race, but apparently I'm wrong. Most seem to see white, and it's largely because the media has made it the default. There's been a roaring debate about this regarding the selection of the 12th doctor for Doctor Who, as well. Great post. My feeling on the subject came from reading an article talking about how white authors feel screwed either way: if they write non-white characters, people get mad at them for getting it wrong; if they write white characters, people get mad at them for supporting the establishment. it's not only a thing white authors deal with. i've been told i've messed up and did it wrong as well. or offended. it's what every author deals with no matter what they write. race just happens to be a more challenging thing to tackle. I write very multicultural characters, but there's one thing that makes it easy for me. That is, I write fantasy. That means I can't get it "wrong," because while I am writing with characters from all over the racial spectrum, their culture is one I have complete authority over. Contemporary writers have a far greater challenge. I've read essays by minority authors where they often say that even though they're Chinese, Mexican, Japanese, or African American, they're still criticized by other minorities for not being "authentic" enough. I do think it's important to be politically correct, but on the other hand I think that sometimes people take that PC stuff too far. That's why I think you're right that it's okay for you to write about Korean culture, especially because it is something that interests you. i don't think it's a matter of being PC. i think it's a matter of doing your research and showing respect. to know that if you portray an asian as a geek, that you are layering it so s/he is MORE than a cardboard asian nerd sterotype. to KNOW that this IS a stereotype in US media about asians. it's no different than writing a fully fleshed white character. only there is much less representation, therefore more scrutiny. the last thing you want is to do a cardboard PoC character and not be able to stand by her/him. Hm, now that I'm thinking of it, I did recently read a fantasy that had me hurling it at the wall, because it did get a race "wrong." Yeah, hey, I did. But I'll tell you what they did. They wrote according to a stereotype. The character was the only one of their race, and so they had the only dialect in the book. It sounded like a bad impression an idiot highschooler would do. And then the person's behavior was equally stereotypical. The character was completely defined--in a fantasy--by a modern American stereotype. So I take it back. Fantasy can get it wrong. For me, getting it "right" really just means making them a real person. How do I know if I've done that? I switch their skin color, and see if they still make sense. If I have a black character, and I make them white, will I suddenly feel like they're not acting "right?" If I've used stereotypes, then yes. I recently changed a character's ancestral origin from England to Mongolia. Nothing changed but his physical description. The rest of him was still there. Just like the rest of us would still be here if we changed the color of our skin. Race doesn't affect us, but culture does. Getting it "wrong" is assuming they are the same thing. I wrote a half-Japanese character also. One reader said I hadn't made enough of her minority race, hadn't made this character feel her "otherness" enough, and hence there was no reason she had to be Japanese at all. Another reader said she was glad to see a character who happened to be a minority whose story wasn't *about* race. I think this issue is a minefield, and I'm glad to see you talking about it. If she was actually from Japan and no one else was, then yeah, I can see the need to play up her otherness, because she's an outsider and she's going to feel it. If she is, say, an American with Japanese ancestry, whose home culture is not directly affected by Japan, then I would definitely agree with your second reader. I should mention my English/Mongolian character was not from either of those countries, but was born in my book's fantasyland. Hence the separation of race and culture. "No one will ever feel comfortable with diversity if we continue to avoid it in our media. People won't start getting it right until we start seeing more examples, more stories, more people stepping up." Yup, Kristan, I've read that. I talk with Ellen pretty often, actually, since we're Friday The 13ners buds. I grew up in Vancouver, British Columbia (Canada), which, being on the west coast, means most of the immigrants are from Asia. After growing up here, where *whites* are actually the minority in many parts of the lower mainland, you pick up a lot of knowledge/behaviour that's *normal* for the city, but not normal for even, say, a town 2 hours outside the city. For example, I only eat in Chinese restaurants that have gai lan on the menu. And easy way to ensure you won't be getting food-court-level food covered in tons of sweet food-service sauces. When I moved to a much *whiter* part of the country for a few years, not a single person I met had ever heard of this tasty green vegetable. I can't remember where I read it, but I think it was a post by Justine Larbalesteir, but she said something like, "character first", "background/race/exterior/etc second", which really resonated with me. We are people first, which *culture* shapes more deeply than skin colour, so shouldn't characters be the same? Your line mentioning that "... inclusion of diversity in all media is that important" is an excellent note, but we can do much for ourselves as well by putting ourselves in diverse situations. Maybe it's as big as immersing yourself in another culture by visiting another country. Maybe you visit Chinatown on a regular basis. Or perhaps you are the diverse individual, because of your ethnicity or maybe not. As human beings, we are each diverse and unique in wonderful, beautiful, bewildering ways. But I digress. To any writers who might fear writing a different race wrong: Please don't. There is no right way or wrong way, and you can't please everyone all of the time. Don't feel you have to write your race only. Because where would that leave me? I'd be writing a story about an Asian adoptee who grew up in a field of Caucasians! That's not a bad thing, but I wouldn't want to limit myself to that. And no one should limit themselves and risk suppressing their creative abilities and story ideas. 100% True. I simply can't! I just CAN NOT write a story with no diversity in it, it comes so natural to me, when I was young I lived in Jeddah and it's a cosmopolitan city, then I came to Khartoum and it's also another cosmopolitan city with a long history of different cultures and migration and more. I love other people, and I find myself in need to know about their lives, cultures and languages, I was curious since I was a little girl :) and K/Drama is sooo lovely and different and refreshing. We need to step up and reach a hand to our fellow men and women in order for the the hate and fear to go away not wait for it to clear away on it's own, that's just not gonna happen. Fearless! we writers need to be fearless. Since I am a Korean, I appreciated this post. 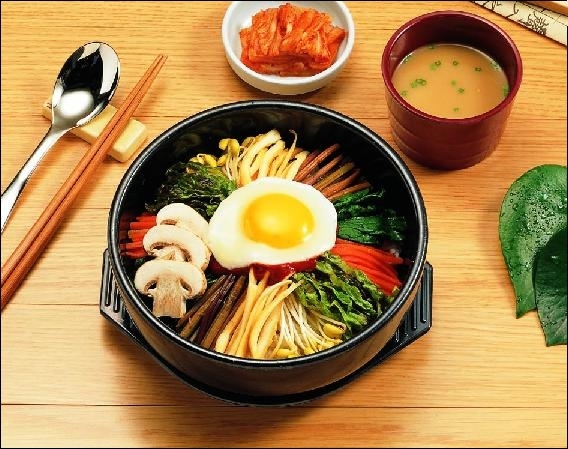 Kimchi is awesome, and so is Bibimbap! To be honest, if I wrote a book, I would feel more comfortable writing about a white chick than a Korean one. I recently read Neil Gaman's Anansi Boys, and while I'm pretty sure Mr. Gaiman isn't black, lol, I felt he did a great job writing them. Your introduction into Kdrama (pregnancy aside) is also how I was with Univision. I watched so many telenovelas, and it got to a point where if someone spoke English on a soap, I found myself trying to read the Spanish subtitles! Great thoughts, Natalie. I have a minor Latino character in my new manuscript. Baby steps. I fall into the group that worries people will tear up my depiction of a character of a different race. I'm just ignoring that fear for now. This girl isn't a nice person in my book, but she serves a function in my story that she would regardless of her race. I used to watch lots of French films when I worked for a video store as a teen. It had a foreign film section. That love for French films evolved into me getting a French pen pal and later visiting France for a month when I was 19. My pet peeve is watching dubbed foreign films. I'd so rather watch them in a different language, but with English subtitles. As I go along, I'll be using a multi-ethnic cast of characters. In my finished MS, there are characters from the Muslim and Israeli world along with my regular characters. I think the key, with any character, is to give them depth and as strong a personality as you can, even with flaws. LOVE THIS: "No one will ever feel comfortable with diversity if we continue to avoid it in our media. People won't start getting it right until we start seeing more examples, more stories, more people stepping up." I'm writing a black character in one of my stories. I was nervous because I didn't know how to introduce her. You can't say, "I walked up to my best friend, who is black." And comparing someone's skin to coffee or chocolate just bugs me. Then I decided to focus on her actual character and worry about that stuff later. I like how you never specifically stated Bea's race in Transparent. I figured she was Hispanic from her physical description, and it just makes sense to have Hispanic characters when the setting is Arizona. But it's the little things, like her using Spanish words and having a brother named Carlos, that confirm it. Well done!